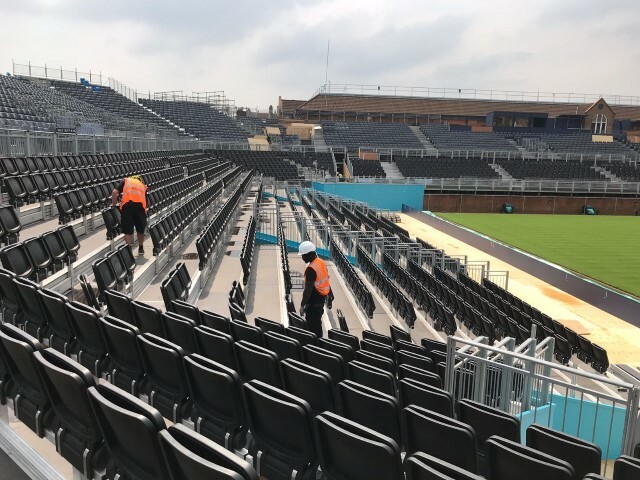 Showforce has been supporting Arena Seating with the installation of grandstand seating for more than 25 years. 2018 is now exception and we’ve already assisted the company with a number of high profile events, including: Ninja Warrior, Women’s Hockey World Cup, and Goodwood Festival of Speed, London Marathon and Royal Windsor Horse Show. One of the most prestigious events and large-scale grandstand installations that Showforce provides crew to each year is for the Fever Tree Championships, Queens Club, London. An annual event on the men’s professional ATP World Tour it was originally established in 1890 and is held each June in the run-up to Wimbledon. It has been consistently supported by the best singles and doubles players of the men’s game and is hugely popular with tennis fans. The 2018 event saw Showforce in action for over six weeks, clocking up an impressive 6540 man hours. The team of crew provided each day included a telehandler driver and multiple climbers, all of whom were equipped and certified with an event specific Working at Height qualification. SHOWFORCE SUPPORTS MONUMENTAL CRICKET WORLD CUP 100 DAY COUNTDOWN EVENT!